Lately, yet more ‘people’ online, who asked to be ‘friends’ on Facebook, have been dishing out what I felt was some extremely personal, mean and nasty feedback. I don’t even know if they are a really the people they say they are, or are using pseudonyms. Sadly, I thought we had resolved it privately, but it seems not as there was zero response to my last private message, replying politely to theirs. These people remind me of the school yard bullies, but online, and hiding behind false names. Hiding behind a pseudonym online… really is not so different to being a bully, except the person is being too gutless to stand up and be counted; being anonymous gives that person so much more power too, but it is pathetic person who refuses to engage honestly and openly (IMHO). Online bullying is real, and getting worse and it needs to stop. They might think they have every right, but it is nasty, cruel behaviour, and being directed at anyone facing a terminal illness, who is simply speaking out for issues such as respectful language to be used by all, is not only mean, it is totally unfair. We all need to think about our behaviour, even them… they ask for respect, but do not offer it, hence are operating from double standards. Cyber bullying is a crime, in Australia and in most countries now, and as such I have taken screen shots of everything I (and that many others) feel was a form of bullying, no matter how mild it may seem to others, in case it continues or escalates. I do have proof, and witnesses. Coming from people in a self-proclaimed “Care Group” who seemed to have trolled the internet to connect with many of my real friends, really is a bit rich!!! There’s no reason for people to do this. At least you’ve got screenshots and can report it to Facebook. I disconnected my Facebook account for other reasons. I’ve never been bullied on Facebook myself or if I have they didn’t do a good job at it. I disconnected my Facebook cause I had family and friends who would see a post by me here and there and thought they knew what was really going on in my life when they had no idea. I thought family and friends would ring and actually talk with me more since I didn’t have Facebook. I waited for weeks for them to ring me but no one did. Has been very upsetting and a real surprise how much family and friends DON’T contact me. Felling very isolated and upset at this. I hope things are a bit better for you now Kate that your off Facebook…. Huge hugs to you and Sonya… wish we lived closer. We’d love you to join us; the Cafe Le Brain is not exclusive to people with dementia, although the support group is but with our partners present if we need/want them to be. Your better off out of the issue’s you were having on Facebook. Silly that it’s still going on without you there…. Nothing wrong with a good debate but bullying is a step to far. Yes it can be very isolating getting off Facebook. I honestly thought family and friends would be more engaged and want to talk more since they couldn’t now just post on my page. It just made the isolation worse. I’m very sad at this and don’t know why they don’t call. This is the first time I’ve felt like this. Obviously I don’t matter as much as I thought…. Thanks for the link to the brain cafe. I’m sorry but I can’t go on there as I have very limited data on my mobile plan. We don’t have a land line cause it costs to much to connect…. It is outrageous that there are so many bullies in this world, who often treat others with such cruelty, because they are ignorant cowards. It is even more disgusting when they lash out at others for being different. People like that seem to feel better about their sour bitter existence by trying to put their misery on others. That type of mean spirited behaviour is not acceptable ever and noone deserves it. You certainly dont, so block them baby and if you can report them, do so. I am also a big believer in karma!!!!! It WILL prevail. Kate, you are right about some of the care groups…I saw some really nasty, mean, and hateful things on them. Bullies, of course, are everywhere in life, but it seems that the relative anonymity of the internet makes people think they don’t have to show human decency and they can say anything they want. And people get hurt by it. Bullying is unacceptable and I applaud you for removing yourself from being subjected to it. No one deserves that. You don’t deserve that. Stay strong and brave, my friend. I wish I were close enough for a coffee, but I’ll continue to follow you here on your blog until the time we can meet in person. Hugs. The most concerning to me, is they say they ‘care’! This post is a sad indication of the faceless, cowardly on-line bullying which has become too common these days. It brings to mind the late Charlotte Dawson who uncovered the identity of some of her on-line bullies and courageously confronted them. These individuals in person proved to be pathetic “nobodies” who were clearly taking out their own inadequacies on others (without remorse) and unfortunately on-line anonymity provides an easy platform from which they spit their venom at those so undeserving. Bullying is rampant both online and in real life. I totally agree with Kate and am saddened to hear her experiences. Personally I was a victim all my life, school yard, so-called friends and even people in positions of power contine to use their power to put me and others down. Several friends know my personal experience lately, therefore I stand with Kate in asking everyone to stand up to Bullies. Thank you Natrice… it went to a new level overnight, so I have ended my affair with FB! Kate, So sorry you are having to go through this inconsiderate bullying! I agree with you that we must use a “person first” was of discussing dementia. The offensive language only serves to prevent people from taking a close look at this insidious disease and the difficulties it presents to the person experiencing it and to those who care for and love that person! Here’s to you! Keep on keeping on! I’m so sorry that you’re experiencing this … so very sorry. I have been badly affected a few times over my 16 years online …. so much that I don’t even bother posting my thoughts sometimes …. well, certainly not on Facebook as it’s easier for them to track me down! Wow. Sorry you are being bullied. When it happens to me on any of my pages I block or delete the offenders. Just done, including deactivate my FB account! 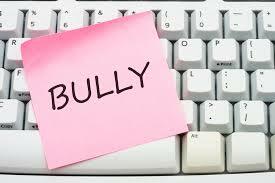 Today internet bullying is much worse than school bullying was in days gone by. I hate these faceless idiots, who do not have the guts to put their names to their own comments. They are to me total cowards. However when their comments are aimed at those with an illness like this, and they take bullying to a new level, and one I simply cannot accept. We have enough problems dealing with this illness without having to deal with these cowards. Keep up your good work and try to ignore these people, because you are much better than them all.
. But would we be high profile if we did not have this illness. Would we be high profile if we sat back and let the illness do its worst. No it’s because we stand up and fight, not just the illness, but we have but we stand up and fight, so that things hopefully will Improve for those following us in the future. It’s all happened to me before, so your not alone, we just have to stand together and put up a united front. I do not understand this jealousy, because we have done nothing to get this illness, it’s not self inflicted, but we are fighters. I admire your work and to many of us your are a star to follow. So please never give up because you are took good to allow this to happen. Love you too dear friend… and had a laugh the other day as someone asked me to add the meanings of the abbreviations I use, including DH to my page, now on the wide of the website!! Kate, my suggestion would be to simply unfriend them and ignore. They thrive on getting a reaction so the best thing we can do is to behave as though they don’t exist. It will drive them mad in a way that rationale argument just cannot. Generally these are not people you would entertain in real life and in all likelihood live sad isolated lives, with online bullying being a way to address their impotence.